Saturday December 4th 1920 I ironed most of the forenoon and Hattie cleaned up the house. Cora at the store. I went to town with Fannie late in afternoon. Did some errands. Took flowers to William and came home with Rob at supper time. Ott & Fannie was with us. We girls all at home. I finished a pair of pillow cases and gave to Cora. 49 years today Delavan school burned. Sunday December 5th 1920 I rode to town with the folks when they went to church and out to Hedges on the street car. After dinner the girls and I went to the cemetery. I stopped at The Hospital. Met Ott & Fannie there and Cora brought us home. Hattie had supper ready. They all went back to town I read all evening. fine day. Monday December 6th 1920 I walked to town about ten oclock. Got me a pair of shoes. Was at Dr. Clevelands office for a treatment. Came home with Rob. Slept in afternoon. In the evening Hattie and I went to The High School entertainment. Reed Hedges took an important part. It was good. Later we went up in the hall when Rob and Cora were dancing and came home with them. 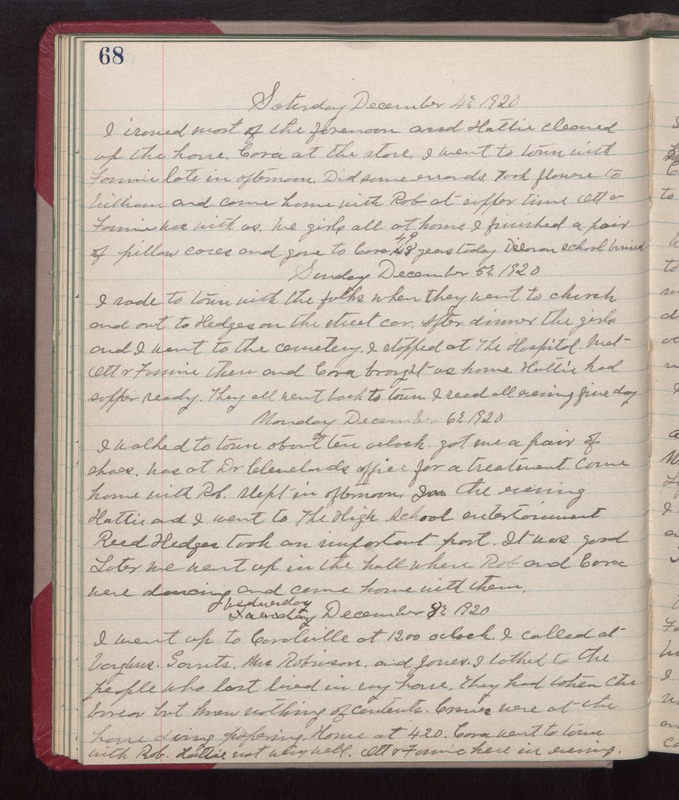 Wednesday December 8th 1920 I went up to Coralville at 12.00 oclock. I called at Vaughns, Garrets, Mrs Robinson, and Jones. I talked to the people who last lived in my house. They had taken the bureau but knew nothing of contents. Cranes were at the house doing papering. Home at 4.20. Cora went to town with Rob. Hattie not very well. Ott & Fannie here in evening.